Among the wide range of vegetables, herbs and plants used in Persian stews or khoresh, in combination with chopped lamp or veal and usual suspects for spice, kangar falls in to the category of a region-specific and less known type – even among Iranians inside the country. 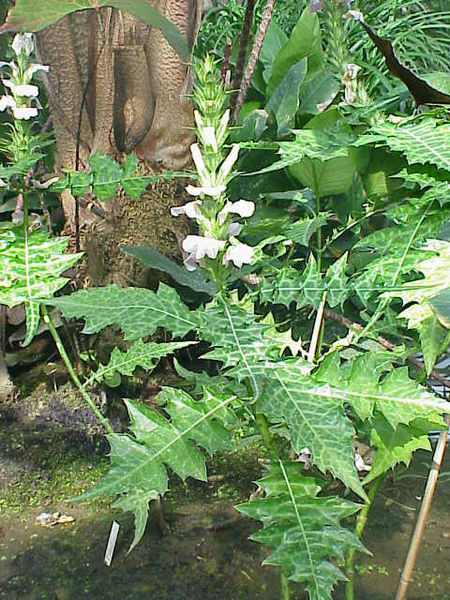 Kangar or acanthus, according to English and Persian Wikipedia, is a genus of about 30 species of flowering plants in native to tropical and warm temperate regions, and originated in Mediterranean, Basin and Asia. 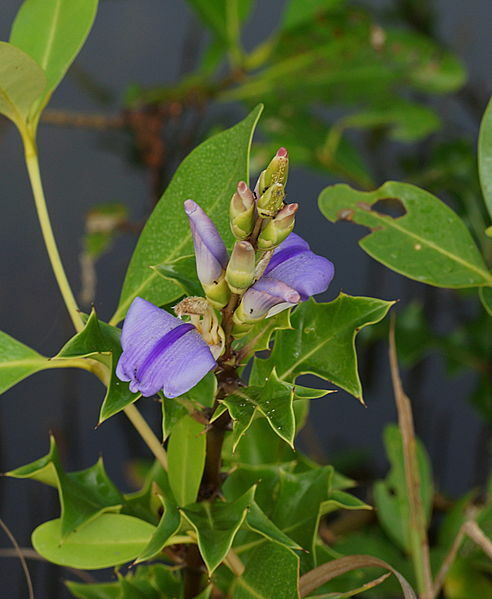 It has thick, spiny leaves, stalks not dissimilar to celery and flower spikes bearing white or purplish flowers. Kangar grows in central and southern Iran in mountains and in dry climate for a short period in March-April. Pictures: taken from the internet. The edible part of kangar is the tender and whitish part of the plant’s stalks which is either sautéed and cooked in stews (khoresh-e kangar) or eaten raw when mixed with yogurt (Kangar-Maast). The plant also bears large gorgeous flowers, which I hear is sold nowadays by the stem flower shops. I recently had a relative visiting us in Montreal whom we asked to bring us some kangar, as this is one of the few items not to be found in any Iranian or Middle Eastern stores here in Montreal. Amazing to think I had not eaten kangar for over twenty years yet had its taste and look stored in the recesses of my mind. Quite an excitement and treat too to make Koresh-e kangar after so many years, especially when I knew the one kilogram of long and far travelled plant’s parts was all I had to work with for this one session meal, although they looked really tired when they arrived (de-frosted, discoloured and saggy)! Here are the two methods that khoresh-e kagar or acanthus stew is made. Ingredients (serving 4): Veal, beef, or lamb 400 gr, washed and cut in small pieces. Kanagr stalks, 1 kg. de-spiked and cut in to 8 cm. pieces. Onion, 1 medium, thinly sliced. Tomato paste, ½ tbsp. Saffron powder ½ tea spoon. Fresh lime juice, or verjuice 2 tbsp. Turmeric, 2 teaspoons. Cooking oil, 4 tbsp. Salt and black pepper to taste. Alternative: Skip saffron. Add chopped fresh mint and parsley, 1 bunch each. Method: In a large pot heat 2 tbsp. olive oil and sauté onion until slightly golden. Add meat and fry with onions for 5-6 minutes. As soon as the onion changes colour, add turmeric and fry another 2 minutes. Add tomato paste, stir, then cover with hot water, add salt and pepper and cook over medium heat until tender. In a frying pan, heat 2 tbsp. olive oil and fry kangar over medium heat till they slightly change colour. Add it to the main pot when the meat is half cooked, as friend kangar needs between 30 to 45 minutes of cooking. Ten minutes before serving add lime juice or verjuice – whichever you used. Meanwhile, dissolve saffron in 1 tbsp. of warm water and add to the pot as well. Taste for adjustment. In my “alternative” option, which is actually the mainstream method, chopped mint and parsley are added to the frying pan with kangar and sautéed for five minutes, then added to the main pot. No saffron is used in this method and verjuice is more common than lime juice. In any case, khoresh-e kangar should be served with Iranian style plain rice, provided of course, you get a visitor from Iran who is willing to bring you some in the first place! 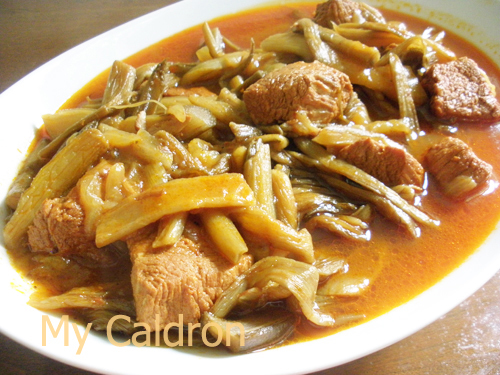 Khoresh Kangar is one of my mom’s favorite stews. We tried finding Kangar here in the States and realized that we could ask our major supermarkets to order it for us. We’ve been enjoying it most springs ever since! I am glad you liked here. Thanks for your message! My parents originally come from the region where khoreshte kangar is one of the main dishes and I haven’t had it for almost 7 years even though its one of my favorite stews… I live in Montreal today but I haven’t seen any, could you please ask your friends where they found the kangar I would love to make it for my mom’s birthday next week.